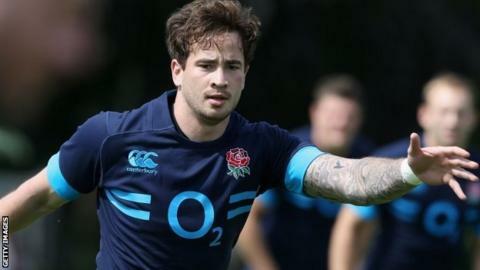 Danny Cipriani has been named in Stuart Lancaster's initial 30-man England squad to tour New Zealand. The 26-year-old Sale fly-half has not played for England since 2008. However, with Owen Farrell and Stephen Myler missing the first Test because of their Premiership final duties at Twickenham on 31 May and George Ford out injured, Cipriani gets his chance. Worcester full-back Chris Pennell is one of seven uncapped players in Lancaster's squad. Front-row quartet Kieran Brookes, Luke Cowan-Dickie, Joe Gray and Dave Ward, Leicester lock Ed Slater and Gloucester centre Henry Trinder complete the uncapped group of tourists. More players will be added to the squad on 2 June following the Premiership final and England's match against the Barbarians. But prop Mako Vunipola is a major doubt after picking up a knee injury in Saracens' Heineken Cup final defeat to Toulon. Cipriani had been selected in Lancaster's training squad earlier this month but was by no means certain to make the tour party. The fly-half has been criticised for his attitude and tackling in the past but was outstanding for Sale this season and will now compete with new Leicester signing Freddie Burns for the Test slot in the first Test against world champions New Zealand on 7 June. "I have coached him before so I know him," said Lancaster. "I am able to steer him in the right direction. "He has matured and he understands more about the game and what it takes to be successful. The penny has dropped. I know he is hungry for the opportunity. He has waited a long time for this chance." The timing of the Premiership final has been criticised as it robs Lancaster of players from both Saracens and Northampton for the match in Auckland, but the coach is adamant his team will be "well and truly ready" for the opening tour game. Bath's Anthony Watson is being treated for a hamstring injury and will continue his recovery in England before a final decision is made on whether he will fly to New Zealand on 2 June.